Have you heard about our Price Match Guarantee? At Argyle Feed & Hardware, you’ll find the best service and selection for all your farm, ranch, and hardware as well as lawn and garden needs in Denton County! We always guarantee our prices and will match any lower price from any local store within a 20 mile radius of Argyle Feed. If you find a product we offer at a lower price, bring in your purchase receipt OR a sale flyer from the competing store showing the lower price. We will match the lower price immediately on your purchase. 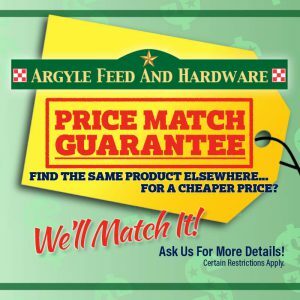 Visit us today at Argyle Feed & Hardware— shop with confidence knowing you are getting top quality service and products at the best possible price— Guaranteed! This entry was posted on Monday, June 6th, 2016 at 6:20 am	and is filed under News & Updates. You can follow any responses to this entry through the RSS 2.0 feed. Both comments and pings are currently closed.